As some, most or maybe all of you know, I drove up to Toronto for an all day group interview for a long sought after shipboard cruise ship position. I would like to talk about my trip there. I know my blog went from posts about positivism to events of my life, however, my life has taken such an overwhelming positive direction and so many great things are happening with my life. Sharing them really amounts to share more about positivism. For the regular followers, all those family and friend that support the great changes in my life and those new to my life and my blog I thank you. What you put out into the world you get back. The more and more positive I share out into the world the more there is that seriously comes back. For me it is happening. I have looked at all these new positives in my life with gratitude, a blessing in disguise, and just plan good luck. I realized last Wednesday, those are all true but it is also those positives I have given out coming back to me. When you hear great sayings and great quote and see that they apply directly to your life it brings and chill of happiness through your body that is unmatched. So I was heading up to Toronto for this amazing interview opportunity, I brought my Himalayan salt rock and my lucky black squirrel. 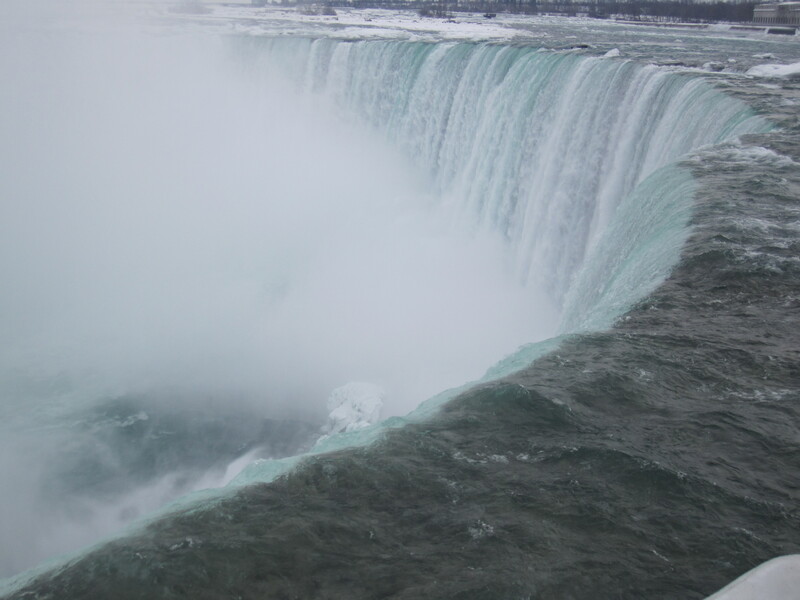 I decided to make a detour to the Canadian side of Niagara Falls. The drive was easy and beautiful, well worth the trip for sure. So many people talk about how beautiful the Niagara Falls are in the summer, but the beauty in the winter is just another spectacular canvas for mother nature. Now on to Toronto, found were my Interview event was then found my hotel. I checked in and went for a walk. I was on a search for a famous Canadian dish, Poutin! It is traditional fries with gravy and cheese curds, but they have entire restaurants with many varieties of Poutin, I even found vegetarian options. You name it, they are putting it on their fries. I love fries…who doesn’t? On my way to and from my glorious Poutin experience I realized I was in China town of Toronto and literally right outside the main downtown area. The diversity of individuals was amazing. Everyone was so nice. I rarely heard a horn honk and their train cars went right down the main streets. The graffiti was actually inspirational instead of obnoxious. The Interview event was all day and amazing. There was about 30 of us taking in tons of information and participating in many individual and group activities. It funny that I say this but I did so much research beforehand that hardly anything I heard was new information. I had hoped to convey that I was well prepared and eager to participate and nail this job. At the end we had to give a presentation to promote a product. This was a huge key to the job. During mine a very interesting thing happened. I messed up my presentation in my eyes but I just kept it going and kept it strong. Now what happened during my presentation was amazing. I was tuned in on both of the recruiters that were there and I could feel their opinions of me click over to a good impression! I actually paused because the connection was so strong and caught myself off guard. That was a great feeling for me but not a %100 you are hired just yet. Let me rewind just a bit, I got caught up on the actually interview but the people who were there are amazing. A few people from around the world and 2 others from the United States. Sitting right next to me was a former Chicago Fire soccer player. If you don’t know I am a big Chicago Fire fan so that was amazing. Then there was a girl I had met there from Canada with a fantastic name. Her name was Geneva Hug. Yes, now you know where the title came from. It was such a unique and beautiful name, and a wonderful individual. It was a name that was hard to forget and if she sees this I hope she does not mind my use of her name! It was so nice to meet Kim Kyle and Greg Scott the recruiters, they had such fantastic personalities. The deed is now done, the interview is done, I headed back to my hotel rewardingly stuffed my face with more Canadian cuisine all that is left now is to wait! The next morning I started my trek home. Back in the states I stopped in Michigan for lunch and check my email on my phone. There was already an email from Kim. She wrote” I am fairly confident you will join pretty fast…. Welcome aboard Marc.” I almost spit out my lunch. I was expecting to wait a week but here it is. I had to call just to be sure. I was not even home yet, she was not even home yet and here it is. I have purchased reading material and cruise company reference guides. I was exhausting even the internet’s amount of information on getting a cruise ship job. I was applying nonstop, each effort got better and better. I was networking like crazy. I punched through so many challenges in this life changing opportunity. It was long and hard, but I never lost hope. I could feel everything start to come together, I could feel myself narrowing in on success. I AM HIRED! The support from family and friend is and has been amazing. I posted of my success on Facebook and the congratulations that came in really surprised me. There are so many people following this journey of mine it really warmed my heart. Not even my best day in the blog world can rival the attention I am still getting from all of the congratulations. I am so grateful for so much support and encouragement. The biggest reason people go for this job is to travel and make money. Those are bonuses for me but the main reason for me was to meet new people, see new cultures of positivism around the world. Geneva Hug, though we did not say much to each other, is the start of my path to meeting more wonderful people around the world. I have the job but the deal is not sealed, I now wait to be assigned to a ship. I also have to pass a very extensive physical examination and gather enough money to start this venture. I will figure it out and I will succeed. I have come too far to fail now but once on board a new set of challenges will be presented. I AM READY! By the way this was the short version. So much has happened just on my trip to Canada alone. All signs in my life are pointing in the direction I am going and it certainly helps keep me going. Thank you very much everyone for all your support. Please take a little time to go and like my Facebook and follow more positivism from Up With Marc. Posted on February 12, 2014, in Personal Stories, Positive Picture, Successful and tagged believe, Canada, changes., cruise ship, Desire, determination, diving, dreams, faith, family, friends, Friendship, future, Goals, gratitude, happiness, happy, hired, hope, Inspiration, Journey, life, love, mother nature, motivation, New Job, Niagara Falls, Ontario, positive, positivism, Poutin, Relationship, shipboard, simplify, success, Toronto, Trip, trust. Bookmark the permalink. 4 Comments. Great trip log Marc! You are about to start a wonderful new life and career adventure. I think I can speak for all of us – your family and friends, this particular one who has known you since you we moved to Charlemagne in St Charles – we are proud of you of course we are happy that you landed such a cool job. We will look forward to future blogs from your various ports of call. Now about that good luck black squirrel. So what’s the story behind this? Is it live, is it stuffed, does it talk to you whe no one is around? Can you share a pic so we all know this is not a figment of your imagination?!? In the event of a shipwreck and you become a castaway (be sure to watch Lost in Netflix) could you make a good squirrel stew of you little buddy if you got really hungry? Enjoy your travels!! Thank you so much for your support and kind words. The black squirrel has just become a good luck charm for me because whenever I see one I have a fantastic day. The squirrel is a stuffed animal and Chris was the one that actually found it for me! If something is real you are giving parts of yourself out. I am sharing pieces of my life in order to receive pieces of others in return. Life is full of positive and negative it comes down to what we want to look for.